Who doesn't love a brand that started in a camper van named 'Yak'? Well, I certainly do! Not only did the wonderful clothing label Lucy & Yak begin with such happy, humble beginnings...it also stands for everything I love; it's independent, ethical and everything is handmade. The creators of Lucy & Yak, Lucy and Chris, work hard to make sure it has a positive impact socially and on the environment. They are passionate about being fair on everyone involved in the making of their clothing – from the tailors they work with in India, to their employees in the UK, who they pay above the national living wage. Environmental issues are incredibly important to them from the 100% recycled clothing bags and 'thank you' cards to the mailing bags they ship everything in, which are100% biodegradable. They also work towards giving each and every customer a good buying experience, when they shop with them. Ultimately, the strive to give back more to the world than they take out. Not to mention, they make really awesome dungarees and other items of apparel - how wonderful! They run a fantastic competition, where every two months they choose their favourite Lucy & Yak illustration, to print onto their thank you cards. Each card goes out to their customers with each order, for the following couple of months. As an Illustrator myself (obviously!) and a massive fan of dungarees, this competition is most definitely for me. 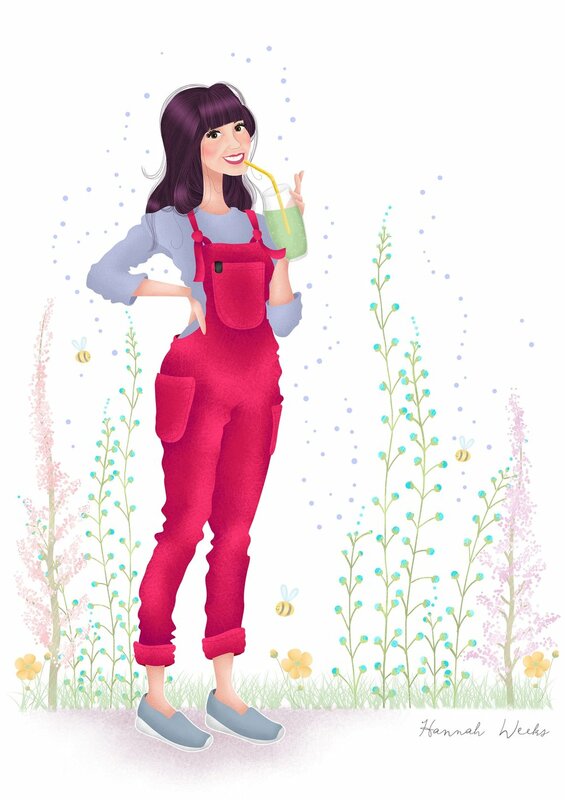 So, I have drawn these pretties... their beautiful raspberry-coloured Luna dungarees! Fingers crossed that my illustration is considered for their cards...wish me luck! I want and need these very much! What is your favourite thing to buy from Lucy & Yak?